The chicken egg consist of a protective, oval eggshell, the albumen (egg white), the vitellus (egg yolk), and various thin membranes. Nutritionally, eggs are considered a good source of protein and choline. Egg white contains approximately 40 different proteins with Ovalbumin (54%), and Ovotransferrin 12% being the major components. Ovalbumin begins to set at 180F/80C while Ovotransferrin only begins to set when heated to 140F/60C. 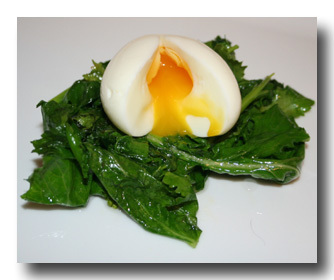 Egg yolks contain lipoproteins which coagulate at about 158F. Coagulation occurs when proteins lose their native, soluble structure, so that they become insoluble. An egg cooked at 150F results in a solid egg white but yolk remains liquid. 150°F/ 65°C--Egg whites become a tender solid although ovomucin yolk cords will coagulate much higher. The yolk protein starts to thicken. 165°F/73°C-- Whole egg sets. If eggs are cooked at 212F for too long they get rubbery as proteins continue to coagulate and water is pushed out from between protein molecules. Using a standard cooking thermometer practice keeping the temperature of a pot of water constant for values from 140F-212F. . This is easier if you have an electric stove, but using a gas stove on a low flame will also work. Cook eggs at different temperatures ranging from 140F- 212F. Compare how the different proteins have changed. This can be done visually taking down careful notes, but it's best if a digital camera is available to take photos. Be sure to discuss this project with your teacher and parents concerning any safety issues. If you plan to eat the eggs be sure to follow Food Safety (see reference below). Break the eggs and separate the yolk from the white. Add them to plastic bags or small glass containers which are heat resistant. This will allow you to heat the yolk and egg white separately at different temperatures. This method will also allow you to change the pH and or salt concentration of the egg mixture providing an additional variable (See below, Effect of Ph and Temperature on Protein) for reference. Do the proteins in older eggs coagulate at different temperatures than fresh eggs? What effect does changing the pH have on the temperature that egg proteins coagulate? What effect does changing salt (NaCl) concentration have on the temperature that egg proteins coagulate? NOTE: MAKE SURE TO DISCUSS ANY SCIENCE PROJECT YOU DECIDE TO DO WITH PARENTS AND TEACHERS BEFORE YOU BEGIN.